‘Activists keep arguing that it takes too long to prove a man guilty. But is that fair grounds to reject the rule of law in favour of kangaroo trials? Maneesh Chhibber: There is a feeling that the Indian higher judiciary is going into areas that don’t concern judges. How do you intend to check that? It is absolutely true that over the last couple of years, there is a widely-held perception that there is a treading into other domains by organs of the state whose remit is not that particular sector. It is equally true that what the judges do or say, they believe they say or do so by the command of the Constitution. Now who will determine the outer parameters and the constitutional laxman rekhas? The Constitution confers that right on the judiciary, yet I believe that recent judgments of the Supreme Court, including the one in the 2G spectrum case, have clearly spelt out the Supreme Court’s perspective with regard to interference in policy decisions. The highest court of the land has categorically reaffirmed the proposition that judiciary cannot concern itself with policy making nor can it go into the questions relating to the political domain. But the judiciary has said that it can intervene in the implementation or the manner of implementation of the policy. I don’t think the government has any quarrel with that proposition. Maneesh Chhibber: It is said that judges get swayed and play to the gallery. Judges are prone to be concerned with the prevailing environment of the day, yet the constitutional and judicial discipline demands that judges decide as objectively as the brief in front of them permits. In a large majority of the cases, judges do decide fairly. There have been cases where the general feeling has been that the judges have said a little more than what justice demanded but that was a more a function of the style of writing a judgment and style varies from judge to judge. Amitabh Sinha: The Shah Commission has given its report on the proposed privacy law. What are your views on its recommendations and on the proposed privacy law? I did take the initiative of establishing a high-powered committee of known experts to discuss the various aspects of the privacy law and the privacy rights that the Constitution confers on its citizens. Our privacy rights are derived from Article 21 of the Constitution. They needed to be translated and enforced through specific privacy legislation. The focus of the commission’s deliberations would have been on how to harmonise the imperatives of privacy protection and the right of the people to know. The right of people to know is as much a part of the constitutional imperative so we need a law which would harmoniously blend these two constitutional imperatives. Amitabh Sinha: Would you say that the right of privacy, when enacted, essentially needs to be applied in inverse proportion to the public office you occupy? The higher you go up, the less the right to privacy becomes? The right to privacy in India, culled out from Article 21, is a right that the Constitution recognises as an integral part of our human rights which is non-negotiable. A citizen who is also a public figure may be expected of greater transparency in the conduct of his official duties. But that argument, in my personal view, cannot be used to deny the very basic right to privacy of a public servant. The two rights must move in tandem. D K Singh: How do you explain the fact that not a single judge has been impeached by Parliament so far? Is it because the judiciary is unblemished or is there some lacunae in the impeachment process which needs to be rectified? I am really happy that the we have not had to use the impeachment proceedings against judges. Having said that, some people may argue that the difficulty in the impeachment procedure makes it impossible for the procedure to be followed. It’s an argument I accept. But it is in the fitness of things that we have inbuilt defences to ensure that the impeachment mechanism is not abused. If you were to make it easier, we would be vulnerable to the argument that Parliament is using the procedure to make inroads into the independence of the judiciary. It is certainly not my case that the judiciary at every level has an unblemished record. We have noticed cases of judicial aberrations. Up to now, we have left it to the inbuilt mechanisms within the judiciary to deal with such cases. But now that we have a Judicial Accountability Bill, we will, hopefully, establish a more effective legislative mechanism for addressing judicial aberrations. Seema Chishti: Your government took a radical step on the Lokpal two years ago when you had a 10-member committee to draft the Bill. Would you think about such pre-legislative committees for future legislation? Certainly, we are enriched by pre-legislative discussions with all stakeholders. I think it is a good thing. Laws are meant for the people and therefore, the more participatory the process of law-making is, the better it is for all. But it is an entirely different thing to say that you could leave the drafting of laws to people outside of the legislatures and Parliament. My view is that the drafting of legislation through Parliament and translating people’s views into the letter of the law must remain the preserve of the legislatures and parliamentarians. And I think my views have been validated by the experience of the past. Harcharan Singh: Twenty- eight years have passed since 3,000 people were killed in Delhi after Mrs Indira Gandhi’s assassination. Not even five people have been convicted. As the law minister today, what plan do you have to see that justice is delivered faster? Long unjustifiable delays in dispensation of justice erodes the faith of people in the justice delivery system. Over the last several years, there have been repeated attempts to ensure that affordable and expeditious justice is available to all. There are seven initiatives in the works now to achieve the promise of the Constitution of affordable and expeditious justice. One of my foremost priorities as law minister is to hasten the process of judicial reforms and that would cut the pendency of cases. We have around 3.15 lakh court cases pending in courts. But we are now introducing and reinvigorating the gram nyayalaya justice delivery system and the Lok Adalat system. The criminal justice system is another story all together and I agree with you that it can become very dissatisfying or frustrating or very oppressive. But I want to say something I believe in with all my heart—please do not, in the quest of momentary popularity or appeasing a sentiment, evade the time-tested system of criminal justice which states that presume a man to be innocent until proved guilty. That brings me to another point: trial by media offends the principles of fair trial which is integral to the rule of law. Media trials are unconstitutional. And yet, every day there is a trial by media on every issue. The argument that would be made by the great activists on television every day is that it takes too long to prove a man to be guilty. But is that fair grounds to reject the principle of the rule of law in favour of kangaroo trials? Harcharan Singh: We had committees and commissions, whether it is the Gujarat riots or the Delhi riots. These commissions take years to gather evidence. What is the use of their findings after so long? I agree that we need to do a lot more and must bring in amendments and changes in the law. We must adequately staff the legal structures by getting in more judges, more lawyers and courts. It will be my endeavour to try and push through the necessary judicial reforms. Pranab Dhal Samanta: Where is the government on the proposal for a judicial appointments commission? Your predecessor also wanted to start a conversation with the Supreme Court on moving the two-judge benches to three-judge benches and looking at a permanent five-bench constitutional bench headed by the Chief Justice. Where are you on these issues? On the second question, I would need to discuss this with the higher judiciary, with the Chief Justice of India. I do recognise that in the last several years, the demand on the judges of the Supreme Court to decide complex issues of constitutional law has increased exponentially and therefore, some kind of structured instrumentality has to be in place to ensure that the best possible judicial decisions are handed down on far-reaching issues without compromising on the judges’ responsibility towards other important litigations pending before them. On the judicial appointments commissions, the consultations with different political parties have taken place. A few details need to be fine-tuned. Prerna (St Mark’s School, Janakpuri, Delhi): India stands 98 among 175 countries on the corruption index. Judiciary can play a positive role in checking corruption. What are your plans? I am not sure if any country in the world has been able to completely eliminate corruption but that should not stop us from endeavouring to do so. It would be my endeavour to be a facilitator in the enforcement of anti-corruption laws and ensuring that the enforcement of criminal laws is not oppressive. 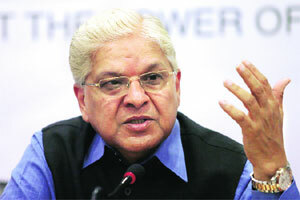 Dilip Bobb: What’s your view on Supreme Court judges taking up government-sponsored jobs immediately after retirement? My personal view, not my view as the minister of law and justice, is that it would be a healthy tradition for judges of the Supreme Court not to accept post-retirement jobs. Having said that, it is equally true that given the complexities of the regulatory regime that we now have to advance our economic and social legislation, there is no substitute for experience. Given also that at the retirement age of 62 years, Supreme Court judges are still active and alert in mind, we need to have some of these wise men on tribunals for a while. Karishma Kuenzang (EXIMS*): Cartoonist Aseem Trivedi was arrested on charges of sedition. What steps will you take to ensure that freedom of speech and expression and the law of sedition do not clash? The charge of sedition can only be brought forward in an almost foolproof case. If every spoken word, sometimes in anger or without full reflection on the spur of the moment, is going to lead to a charge of sedition, then I do not know who will be saved from that charge. Yogesh Rajput (EXIMS): As a former minister of science and technology, why do you think the government gives less importance when it comes to allocation of funds in R&D and science and technology? The PM accords the highest importance to science and technology. In the 12th Five Year Plan, we have significantly increased public spending on R&D. It used to be less than 1 per cent of our GDP in the 11th Plan. In the 12th Plan, the R&D expenditure, both in the private and public sector, will be increased to about 2 per cent of the GDP, the single highest growth of expenditure in any department. N P Singh: Should we see the transfer of Mr Jaipal Reddy to this ministry in the context of the PM giving priority to science and technology? It may well be. I have the deepest respect for Mr Reddy, both for his scholarship and for his ability to read and grasp complex issues of science and technology. D K Singh: What are your views on Arvind Kejriwal’s allegations that Mr Ranjan Bhattacharya influenced the government during Mr Vajpayee’s prime ministership? I don’t want to dignify the comments of Mr Kejriwal by my rebuttal or by my comment. I am also not defending Mr Bhattacharya, but if Mr Kejriwal has said anything about an individual based on his information, who am I to comment? Shishir Tripathi (EXIMS): When Justice Katju was in office, he raised the issue of nepotism in the judiciary. It’s true that there has been a perception that this is not a healthy practice. I do not know what to say. Does it mean that if somebody needs to be elevated to the judgeship of the High Court, his nephew, son or daughter have to move out of the court? Or does it mean that he should decline to become a judge just because he does not want to deprive his children of the opportunity to practice in court? You need to have a balance on such issues. Prashant Dixit (EXIMS): Several decisions of khap panchayats have created a furore. Don’t you think that the judiciary should interfere? The law of the land is supreme and their decision is to be respected by all, be it a khap panchayat or any other panchayat. The relentless campaign against the Comptroller and Auditor-General, of an unprecedented ferocity, compels me to write again on the subject. First, has the CAG caused a political and constitutional crisis, as some have argued? All that the CAG does is to submit audit reports. Any audit report, if it is a good report, is bound to contain elements that can be used for a criticism of the government. Using the report to stall Parliament was a clear, declared political decision of the Opposition. To say that the CAG shares the responsibility for this amounts to saying that the CAG should not have submitted a report at all, or should have submitted a totally bland report from which no party can pick up any point for criticising the government. G. Mohan Gopal, a highly respected legal expert, makes two main points (The Indian Express, 10 September 2012): the fallibility of the CAG, and giving illegal advice to the government. The fallibility of the CAG is a truism; no one ever denied it. There are two important procedural safeguards against errors in the audit reports. In drafting paragraphs for inclusion in the audit report, substantiation has to be provided for every remark through ‘key documents’. This is a stringent requirement. After such internal procedures, when the first draft of the audit report is ready, it is sent for comments to the Ministry or organisation under audit, and is revised in the light of comments received. If I am not wrong, this process is repeated more than once. At every stage, the executive can draw attention to errors of fact or understanding or law, if any, in the report. In fact, apart from corrections or revisions being made in response to comments, the initial objections themselves are dropped in many cases in the light of explanations by the executive. Not every comment initially formulated finds its way into the final audit report. The fallibility of the CAG is a red herring. Turning to the charge of ‘illegal advice’, the CAG did not give any legal advice on his own on the choice between administrative instructions and amendment of the Act; he was only citing an advice of the Law Ministry of 2006. It might be Mr. Gopal’s view that the advice was wrong, but I doubt if the Law Ministry would accept that view. The CAG’s point was that in July 2006, on the basis of the Law Ministry’s clear advice at that stage, competitive bidding could have been adopted through administrative instructions. Anyway, that is only a hypothetical point; the final decision was to amend the Act. The CAG did not question that decision. He merely pointed out that the time it took to arrive at that decision (for whatever reasons) meant the continuance of the procedure of selections by a Screening Committee. Further, he did not even criticise that procedure per se, but only the absence of openness, transparency and fairness in that procedure, and the difficulty of determining the basis for the selection of parties. What remains of the illegality charge? Mr. Gopal makes another point, namely, that mining licences could be granted only by the State governments, and that the Screening Committee was just that, namely, a Screening Committee, and that it was making no allocations of coal blocks. I am sure the CAG will have something to say on this, but as a layman let me ask Mr. Gopal a few simple or simplistic questions. Why was there a Screening Committee at all? What was it screening for? If it was not making allocations of coal blocks, what exactly was it doing? If there was no such thing as ‘allocation of coal blocks’, why did no one say so when the draft audit report was under discussion between the Ministry and the CAG? Did the Ministry question the term ‘allocation of coal blocks’ at any time? On all these matters, did it not occur to Mr. Gopal that he should take the precaution of checking with the Ministry and the CAG before publishing his rash remarks? Mr. Gopal castigates the CAG for calculating “losses arising from obeying the law”. That is a highly tendentious statement. First, what the CAG is talking about is not ‘losses’ to the government, but windfall gains to the recipients of the allocations. Secondly, it is preposterous to say that the CAG is calculating ‘windfall gains’ as arising from the government following a legal course. His point is that the allocation of coal blocks confers windfall gains on the recipient parties, and so the process of selection of parties should be fair, objective and transparent. This would apply, whatever the route followed for the selection of parties. As for Kapil Sibal’s criticism of the CAG for making policy (The Times of India, September 15, 2012), the answer is threefold. First, the CAG does not make policy prescriptions. He draws inferences from his audit findings and makes some consequential recommendations for the government’s consideration. It is for the government to consider and accept or reject them. Secondly, the CAG picks up policy decisions or recommendations from the files and tries to find out whether they were acted upon promptly or at all. Thirdly, where there is no recorded and reasoned policy decision behind the executive action, the CAG examines the rationale of the action. If there is a clear record of the reasoned adoption of a policy, the CAG does not and cannot question it. Mr. Sibal also says that maximising revenues might not always be the government’s objective. True, but this should be a recorded ex ante decision, not an ex post facto rationalisation. Again, the allocation of coal blocks is of course an executive decision, but would Mr. Sibal argue that the arbitrary and discretionary allocations of scarce natural resources are an executive prerogative that the CAG cannot question? Finally, there is the disingenuous argument that the executive is accountable whereas the CAG is not. 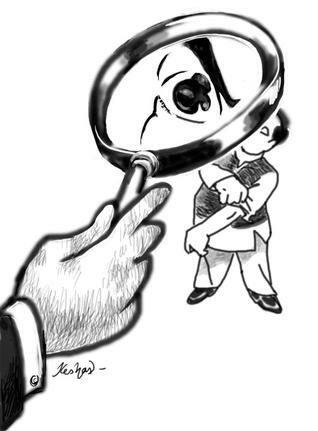 The executive is of course accountable to Parliament and the people — through the CAG — though every attempt is made to evade it and obfuscate issues, as in the present case. As for the CAG, the argument is presumably that he should be accountable to the people for the quality of his audit. He is our supreme audit institution, and we cannot ask another auditor to second-guess his audit. Besides, apart from the Ministries and other government organisations and public enterprises, even IITs, IIMs, private companies, etc, can come within the scope of his audit if they receive funds or allocations of natural resources from the state; and the CAG nominates private sector auditors for the audit of public enterprises and test-checks their audit. Which of these agencies or organisations can be asked to undertake an audit of the CAG’s work? In any case, such an imposition on the CAG would be unconstitutional. All this agonising is unnecessary because the CAG is not exempt from criticism. (That is perhaps the understatement of the year, considering the campaign that is going on.) As already mentioned, the executive has plenty of opportunity to challenge every statement in the audit report at every stage, including the stage of examination by the PAC. Secondly, there is a discussion of all this in the media, and many commentators analyse the audit reports. Is this not a form of accountability? If there is to be a peer review of the work of the institution of the CAG, it has to be initiated by the CAG himself. The CAG has in fact done so. He constituted an international panel consisting of representatives of the SAIs of several countries to conduct a review of his organisation’s work, and the panel is understood to have submitted its report. In conclusion, it is sad that persons of such eminence should attack a constitutional functionary either on the basis of inadequate understanding or with the deliberate intention of obfuscating issues. Rather than using the Supreme Court’s judgment to improve governance and reduce discretionary powers, the government is making a desperate attempt to restore false prestige by seeking a review of 2G verdict. The United Progressive Alliance government’s petition seeking a review of the Supreme Court judgment cancelling 122 telecom licences makes another desperate bid to protect its discretionary powers in the allocation of scarce natural resources by arguing that auctions cannot be the only method for its allocation. However, the government’s petition, apart from stubbornly repeating old arguments that have been shot down by the courts several times over, goes on to expose a flawed interpretation of the Supreme Court’s judicial reasoning.While the judgment addresses itself specifically to the massive commercial value attached to “scarce” natural resources, the review petition conveniently refuses to acknowledge either scarcity or commercial value while arguing that restricting the allocation of “natural resources” to auction methodology will lead to arbitrary consequences and hurt public interest. Unsurprisingly, the government is unable to explain how. Despite the government’s opposition to auctions, its petition fails to explain why auctions were chosen for spectrum in 1995, 2001 and 2010 and, further, recommended by the TRAI in February 2011. Or how a first come, first served (FCFS) system can work in a situation where demand (in terms of equally placed candidates for the scarce resource) far exceeds supply, or even why the government feels obliged to refuse legitimate revenue from applicants who are willing to pay for spectrum based on their business case. In the 2G scam, scarce spectrum allocated cheap through a FCFS method was monetised through “private” auctions, ensuring gains for individual promoters rather than the people of India. The petition steers clear of the fact that auctions can be designed for a specific outcome by imposing conditions such as price caps for voice calls and SMSs, or a lower rural tariff. For example, when auctioning toll roads to the highest bidder, the government ensures that pedestrians, cyclists and two-wheelers are allowed free passage. While finding fault with auctions, the government is at a loss to demonstrate what the fault is. For the government to assume that the judgment bans any alternative methodology to auctions is naive. If the government attempts an auction at a certain reserve price, fails, re-auctions at a lower reserve price and fails again, it must use another methodology. However, the Sachidanand Pandey vs the State of West Bengal case cited by the government itself demands that these circumstances be compelling and documented. Ironically, the petition not just fails to document compelling reasons but ignores the fact that the judgment only relates to those natural resources which are scarce and deliver monetisable commercial value in private hands. It is equally inexplicable why the government is openly uncaring of the fact that except for auctions, practically all other methodologies — and FCFS or beauty parades in particular — violate Article 14 of the Constitution. In addition, auctions support the policy provisions of the National Telecom Policy 1999 seeking transparent allocation of spectrum; the 10th Five Year Plan linking spectrum pricing to scarcity; the Prime Minister’s letter of November 2, 2007 seeking 2G auctions/market-based pricing; Finance Secretary D. Subbarao’s attempts to secure auctions/indexation-based pricing for 2G spectrum, and the Group of Ministers (GoM) decision to auction 3G spectrum in 2010. Despite this, in a laughable attempt to argue against auctions for “scarce” natural resources, the petition quotes cases of award of contracts without auctions for resin tapping in Kashmir, saal (oil) seeds in Madhya Pradesh and “distilleries” (liquor), which hardly qualify as scarce natural resources. The government is opposed to judicial scrutiny of “government policy.” Can it hope to establish a Minister’s illegal decision implemented without the Cabinet, the GoM or the full Telecom Commission’s approval after bypassing opposition from the Prime Minister, the Finance Secretary and the Law Minister as government policy? The government’s own claim in its affidavits in the Supreme Court, multiple press releases, interviews and statements is that the former Telecom Minister, A. Raja’s decision was based on telecom regulator TRAI’s recommendations. Any decision of the government based on TRAI’s recommendations is open to full judicial scrutiny under Section 14 of the TRAI Act. So on what grounds can the government claim insulation from judicial scrutiny? The Supreme Court judgment rightfully categorises auctions as a “methodology.” Decisions of the Cabinet to liberalise a sector, allow or increase foreign direct investment and invite private capital are matters of policy, but its implementation in terms of timing, procedure and terms and conditions are executive decisions. In the telecom sector, the latter falls strictly in the purview of the TRAI Act. The government’s decision-making in this respect is curtailed by law under Section 11(1)(a)(i) & (ii), read with the second, fourth and fifth provisos of the TRAI Act. In effect, all procedures like FCFS, beauty parades or auctions qualify for judicial review. Even if one were to accept the government’s fragile claim that FCFS is a policy and not an executive decision, the petition still fails to demonstrate a single public announcement of this so-called policy since the formation of the Unified Access licence regime on October 31, 2003. It is missing in TRAI’s October 27, 2003 recommendations, the Cabinet decision of October 31, 2003, the licence guidelines and amendment of the National Telecom Policy 1999 on November 11, 2003 and even revised licence guidelines announced by the UPA government on December 14, 2005. The government is welcome to demonstrate otherwise. Had the FCFS “policy” not been kept a state secret, applicants would have queued up earlier than they did. The truth is that the FCFS process was deviously announced for the very first time by Mr. Raja at 1.47 p.m., less than two hours before executing the 2G scam on January 10, 2008. 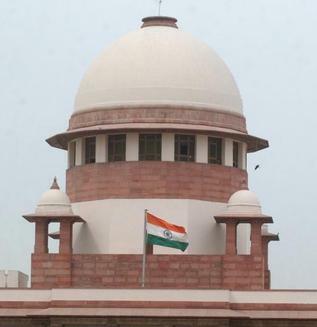 Finally, even though rarely used, the powers of the Supreme Court in entering and adjudicating on the government’s implementation of policy are indisputable, especially when the implementation is secretive, arbitrary, illegal, malicious, discriminatory and violates multiple provisions of law (in this case the TRAI Act) and Article 14, 19(1)(g) and 21 of the Constitution guaranteeing equal opportunity through transparent procedures for all citizens to access a resource/contract allocated by the government. The government’s tiring correlation of FCFS with public interest in terms of affordability, growth, and teledensity is also unsubstantiated in its petition. How auctions hurt urban or rural teledensity or affordability is not explained. Was the UPA intending to hurt public interest by holding auctions for 3G in 2010? Can it explain how Vodafone continuously cut back tariffs after paying $12 billion to buy out Hutch’s stake in Hutch Essar in 2007? Why does higher revenue for the exchequer, which translates into roads, schools, hospitals and welfare schemes for the poorest of the poor, not count as public interest? One would expect the government to be peeved about the reality of Mr. Raja’s FCFS performance, which led to windfall gains for new operators who pocketed 30 per cent of scarce spectrum to serve less than 5 per cent of India’s subscriber base. The failure of these firms to roll out telecom networks has forced the government to initiate steps to terminate their licences. Despite this, the government continues to argue that bringing in these companies served public interest, teledensity and affordability. How does the government hope to justify its obsessive compulsion in ensuring a level-playing field with incumbent operators for seven illegally picked new entrants while totally ignoring the fact that 343 similarly placed applications were denied a fair chance of accessing 2G spectrum? Ludicrously, the government is arguing its right to discriminate in the application of the level-playing field itself. Unfortunately, the review petition has no substantial counter to offer the Supreme Court on these critical issues despite access to the finest legal brains in the country and within the Cabinet. The Attorney General and other legal luminaries have already argued all these issues and still failed to impress the court. 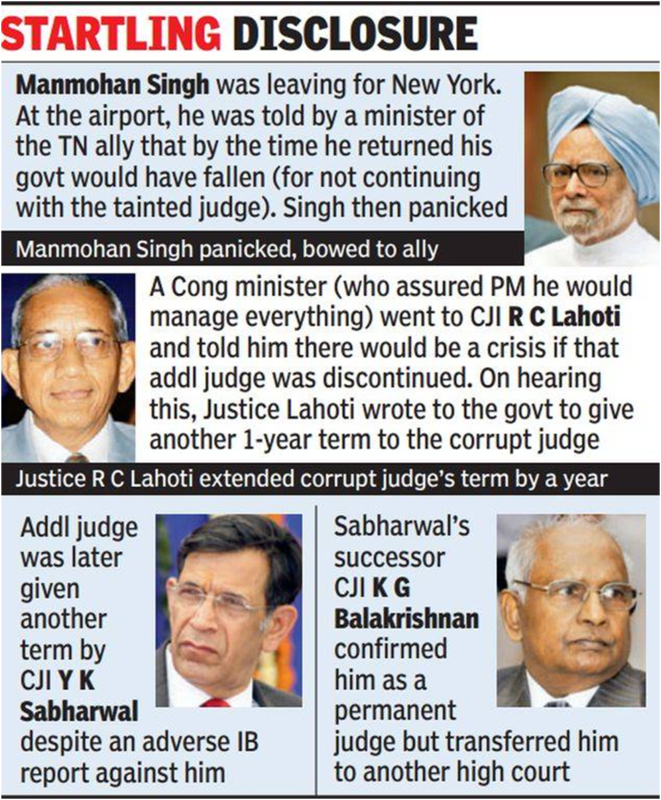 One would have hoped the government would be mindful, even grateful, for the Supreme Court’s restraint in avoiding any adverse observations in its judgment on issues of collective Cabinet responsibility, the Prime Minister’s failure to check a Minister, or the Finance Ministry’s inability to invoke its powers under the Government of India (Transaction of Business) Rules to stop a Minister from grievously hurting the exchequer and, by consequence, the common man. Instead of implementing the judgment and restoring its lost dignity, the government is provoking the court, increasing uncertainty and wasting time with its attempt at a review. Perhaps, like the election verdict, it is time for the UPA to accept defeat in the 2G matter, gracefully or otherwise. The 2G judgment goes beyond telecom, spoiling the party for corrupt politicians, bureaucrats and big business. It is only after navigating through the anger of unrepentant telecom firms and the grief of stricken investors and employees facing an uncertain future that one encounters the real impact of the Supreme Court judgment cancelling 122 illegal telecom licences last week. Its immediate, most obvious impact is a strong judicial attack on the opaque spectrum allocation process used by the government since 2001, first on a subscriber-linked criterion and later, on a first come, first served basis, which was exploited in 2008 in the worst possible manner by jailed ex-Telecom Minister A. Raja. The uncertainties that follow will be confined to the medium term, culminating in the delivery of tangible justice — the reassignment of licences and spectrum at a market-determined price. The reverberations of the judgment actually extend far beyond telecom, crushing the subjective power of the government to issue licences and contracts in any sector like power, coal, minerals, mines, land, and even special economic zones (SEZ), that allocates scarce national resources. This effectively attacks the fountainhead of all large corruption linked to government contracts. The first irrefutable principle of the judgment is on the issue of ownership and control of natural resources provided under Article 39(b) of the Constitution: “The ownership and control of natural resources of a community should be distributed so as to best sub-serve the common good but no comprehensive legislation has been enacted to generally define natural resources and a framework for their protection.” With the government dithering on such specific legislation, the judgment has become the de facto law in the matter. Recognising that while the state is deemed to have a proprietary interest in natural resources, it must act as a guardian and trustee, the judgment affirms that the people are the designated owners of natural resources in any country. Acknowledging the high economic value of natural resources, the judgment recognises that these national assets are scarce, finite, and susceptible to degradation in case of inefficient utilisation. Highlighting the issue of “public trust,” the judgment quotes from several international judgments, including the famous American one, of Illinois Central R. Co. vs Illinois, and the ones in India such as M.C. Mehta vs Kamal Nath to make the point that: “Public interest doctrine enjoins upon the government to protect the resources for the enjoyment of the general public rather than permit its use for private ownership or commercial purposes.” At the heart of the public trust doctrine is the limits and obligations upon government agencies as administrators on behalf of all people, especially future generations. This shatters the government’s stand that the allocation of natural resources is its sole preserve, and such ‘policy’ decisions should not be open to public or legal scrutiny. Traditionally, courts have been reluctant to review ‘government policies’ as they are considered an exclusive prerogative of the executive and formed after considering expert opinion. Invoking the doctrine of equality deals the hardest blow to the opaque allocation procedures for natural resources that are in use for award of Central and State government contracts. The judgment states that the doctrine of equality which emerges from the concept of justice and fairness must guide the state in determining the actual mechanism of distribution of natural resources. This has two aspects: first, it regulates the rights and obligations of the state vis-a-vis its people and demands that the people be granted equitable access to natural resources and/or its products, and that they be adequately compensated for the transfer of resources to the public domain. This considerably debilitates the government’s line in applying subjective criteria such as first come, first served or beauty parades when allocating natural resources in the future. Additionally, it requires the national exchequer to place a value on a natural resource before granting any party the privilege of using it. The second part of the equality doctrine is explained as the need to regulate the rights and obligations of the state vis-a-vis private parties seeking to acquire/use resources and demands that the procedure adopted for distribution is just, non-arbitrary and transparent and that it does not discriminate between similarly-placed parties. This specifically addresses legacy issues of changing the goalpost after the game has begun such as tampering with cut-off dates or altering the qualifying criteria after applications have been submitted or bids placed. Overall, it ensures that every party has an equal chance of transparently acquiring the asset, based on the rational value that it believes can be derived from the acquisition. The judgment specifically tears apart the first come, first served system, firmly re-establishing auctions as a preferred option. Auctions can do much more than just raising revenue. They are quicker, more efficient and more economical than administrative allocation; ensure equitable access to natural resources; protect public trust; and protect equality as upheld in Article 14 of the Constitution. The telecom experience shows us that those who pay a market price base it on their expectation of revenue generation. Therefore, they are the first to rollout networks, best serving the objectives of tele-density, affordability and competition. The judgment is unbending in its view that licences or natural resources given through devious and unconstitutional means cannot plead equities, investment or consumer interest even if they have not been a party to an unconstitutional and arbitrary allocation. Bidders with the slightest hint of ongoing mischief must now walk away, rather than participate. The fact that licences awarded illegally can be cancelled four years after they were allocated should send the fear of god in the minds of those who believe that investment and consumer interest will sway the courts once time has lapsed. Simply put, the judgment gives judicial muscle to the message that from now on, offenders will be punished irrespective of political status, financial power and the time or money that may have been invested in an act that was illegal to begin with. Striking a blow against corruption by empowering all those — non-governmental organisations, enlightened citizens and activists — fighting big corruption, this landmark judgment carries the potential of fast-tracking the pace of administrative reforms and governance in India in a manner not witnessed in the past. The Lokpal bill has thrown up an important issue for the judiciary to ponder. Should the Chief Justice of India or a sitting judge of the Supreme Court be a member of the selection committee to appoint the Lokpal and, worse still, the director of prosecution? The committee is to be chaired by the prime minister, with the speaker of Lok Sabha, leader of the opposition in Lok Sabha and an eminent jurist nominated by the president as its other members. For appointing the director, it is a three-member committee, chaired by the prime minister, and with the leader of the opposition in Lok Sabha, apart from the CJI or the judge. Ostensibly, the provision looks benign, but in reality is fraught with serious issues of legality and, more importantly, propriety. Not that judges never sit on committees. The collegium for appointment to the higher judiciary is, after all, a committee of judges; judges sit on the committee for appointment of members of judicial tribunals; they preside over advisory boards to opine on the continuity of preventive detention; it is a judges’ committee that inquires into charges of misconduct against their own brethren; and judges adorn the governing bodies of premier law colleges in the country. None of the functions enumerated above is inconsistent with the role demarcated for the judiciary under the Constitution. They all pertain to matters concerning the judiciary or aspects integrally connected with it. Membership in a committee for the appointment of the Lokpal or the director of prosecution can never be bracketed with the above. But what is so improper or illegal about their being members of the selection committee? The Lokpal is a glorified investigating agency. It inquires whether a case for prosecution for corruption is made out, and if so found, a case is filed in the special court against the individual concerned. The director of prosecution heads the prosecuting wing of the Lokpal. These functions are purely in the executive domain. No doubt, an incumbent or retired chief justice or an incumbent or retired judge can be considered for appointment as chairperson or judicial member of the Lokpal. A simple procedure for consultation with the judiciary, as it obtains in the Karnataka Lokayukta Act, would have more than fulfilled the requirement of fairness. The problem is in statutorily compelling the CJI or a nominated sitting judge to be a member of a selection committee, predominated by political personages. Such a role will not only undermine the high office of a judge, it will also be a serious affront to the doctrine of separation of powers and an assault on the independence of the judiciary. This is quite apart from the fact that it ill behoves a sitting judge to engage in animated discussion with politicians on the merits and demerits of a likely appointee. It is not uncommon that similar appointments have been challenged before the higher judiciary and there have been cases where the selections have been found fault with and struck down. The Restatement of Values of Judicial Life states that a judge shall not express his or her views in public on matters likely to arise for judicial determination. The Constitution favours an arm’s-length relationship with mutual respect between the organs of the state. It is not just friction, any kind of cosying-up would also cause unease in the citizenry. There is another fundamental aspect of the matter. 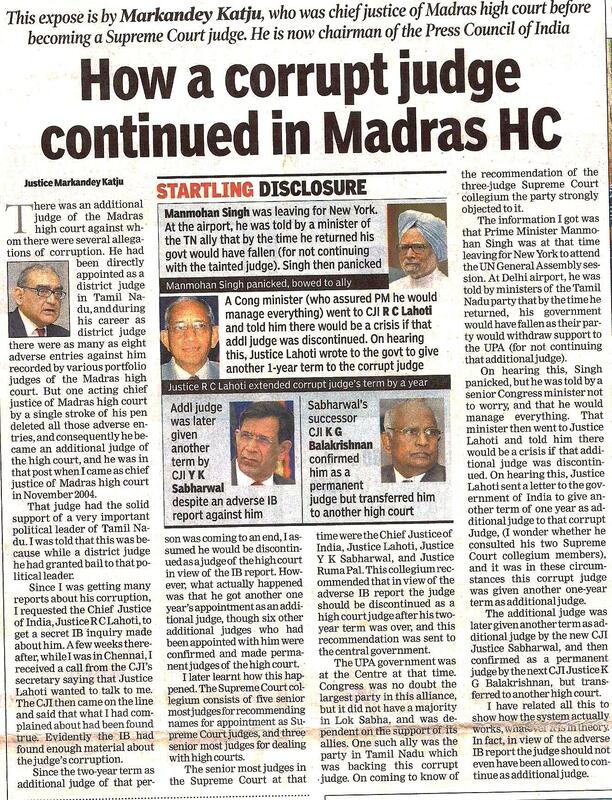 Before any duty, not directly connected with the discharge of judicial functions, is assigned, the government should take the judiciary into confidence. What if, after the bill is passed, the chief justice refuses to participate? Would that be an abdication of a statutory function? Judicial time is invaluable and any encumbrance on it should be constitutionally permissible and should always be with consent. It is time the judiciary discussed in-house the issue as to when and in what circumstances can the government either statutorily or otherwise involve incumbents of the higher judiciary and allot them duties. If a sitting judge is to be spared even for a commission of inquiry, on a definite matter of public importance, the convention is to consult the judiciary, before making the announcement. It is a serious matter concerning the independence of the judiciary and neither the government nor the judiciary should be placed in a predicament, by resorting to hasty measures. The debate in Parliament on the proposed Lokpal legislation has unfortunately touched a nadir; instead of discussing the legislation in a sober atmosphere and making a conscious effort to arrive at as much consensus as possible, the political parties are instead indulging in acrimonious and heated exchanges. The exercise of the government in furtively slipping in various quotas, including for the minorities, appears a deliberate one with one eye on UP elections, notwithstanding doubts on the legality of it expressed by former Supreme Court judges and jurists. Why would any one imagine that the selection committee comprising the Prime Minister, Leader of Opposition in the Lok Sabha and the Chief Justice of India, would not consider members from amongst Muslims and women, when any number of them are available from these sections on their own merit ? Why indeed was this non-issue allowed to take over the debate, unless it was a device to stall the Lokpal legislation ? Let us not forget that parties led by Mulayam Singh and Laloo Prasad were the ones which sabotaged the Women’s Reservation Bill by insisting on a sub quota for the OBCs. They managed to embarrass Sonia Gandhi and Sushma Swaraj, who had earlier embraced, without any embarrassment, and congratulated each other over their victory in the Lok Sabha. But they had to beat a retreat in the Rajya Sabha. The suggestion that if there are allegations against the Prime Minister, they would be decoratively shelved and brought out after he remits office (which may be even 5 years later), also does not make any sense. An incumbent Prime Minister of Italy this year was forced to resign on corruption charges after he was found to be guilty by a court. Similarly Jacques Chirac, a former President of France was recently sentenced to 7 years of imprisonment, again for corruption while a former President of Israel has been sent to jail on grounds of sexual harassment and moral impropriety. The most contentions matter of the CBI also remains unresolved. Ideally, the appointment of the Director, CBI should be by a joint committee consisting of the Lokpal and a Standing Committee of Parliament. Give the CBI Director a fixed tenure for five or ten years. He should have full administrative control over the staff of C.B.I. and over earmarked funds from the Consolidated Fund of India. There should be no interference with his day to day work by the Central Government or the Lokpal. However the Lokpal would be entitled to ask and receive reports from him at regular intervals. The Director, CBI shall not be removed from service except in the manner and on similar grounds as a judge of the Supreme Court – in the same manner of removal, which applies to the removal of the Chief Election Commissioner. Surprisingly, not withstanding bitter wrangling on most other aspects, all Members of Parliament have unanimously agreed to keep themselves outside the ambit of the Lokpal and the CBI for any corrupt action and bribery inside the Parliament. To me this is scandalous and unacceptable. In their defence, Members of Parliament invoke Article 105 of the Constitution, and the widely criticised majority judgment (3 against 2) in the Narasimha Rao case (1999). The minority judgment, however, had warned that this interpretation could lead to a charter for corruption and elevate Members of Parliament as “super-citizens, immune from criminal responsibility”. It would indeed be ironic if a claim for immunity from prosecution, founded on the need to ensure the independence of Members of Parliament in exercising their right to speak or cast their vote in Parliament, is put forward by a Member, who has bartered away his independence by agreeing to speak or vote in a particular manner in lieu of illegal gratification. In other countries such a conduct of MPs is treated as criminal, since 1875, for example, in Australia. The matter of Lokpal is too important and needs to be discussed more seriously and not under pressure of forthcoming elections in Punjab and in Uttar Pradesh. The knee-jerk reaction of the Central Government to Anna Hazare’s threat of fast, was possibly prompted by the Opposition’s eagerness to cash on the civil society movement and opposition leaders cosying up to Anna Hazare. Their puerile excuse that they sat with Hazare because they wanted to explain their point of view is unacceptable political behaviour. Political Parties should hold their own meetings to explain their position to the public. Anna Hazare does have the right to muster support, arouse masses and exercise his democratic rights – and to put pressure on the government and even the Parliament, to pass a particular law because the ultimate sovereign are the people. But there is a caveat that this discussion requires a calmer atmosphere. Could the parties unanimously agree to adjourn the discussions till after the UP elections are over, with a pledge to pass the legislation as the first item when Parliament begins its next session ? As a measure of his genuine concern for a strong Lokpal, Anna Hazare on his part, one hopes, would reciprocate by not going on fast or agitation. He can rest assured that people’s determination to have a strong Lokpal is not so weak as to let the government ignore its solemn pledge to pass the Bill. If the government prevaricates, it must know that consequences could be monumental and no government can remain in permanent confrontation with its real masters, the people of India. The amended Lokpal Bill being debated in Parliament does not appear to give enough powers to the institution of the Lokpal (Ombudsman) to deal with corruption within the government. Despite the government claiming that it has given enough powers in the Bill and addressed the concerns raised by Anna Hazare, he has already rejected the Bill introduced in Parliament and has proceeded on fast in Mumbai. He has also threatened to demonstrate outside the houses of ministers and MPs in New Delhi. He has also called upon the people to fill the jails (Jail Bharo) and has warned the Congress that he would himself campaign against the party in the forthcoming elections in five states. The ruling Congress President Sonia Gandhi has picked up the gauntlet, declaring that the party is ready for the fight. The key issue is control over the Central Bureau of Investigation (CBI). The government has rejected the demand for transferring its administrative control to the Lokpal or to any independent agency. Apparently, the government has a lot to hide and, therefore, cannot allow its omissions and commissions to be exposed. 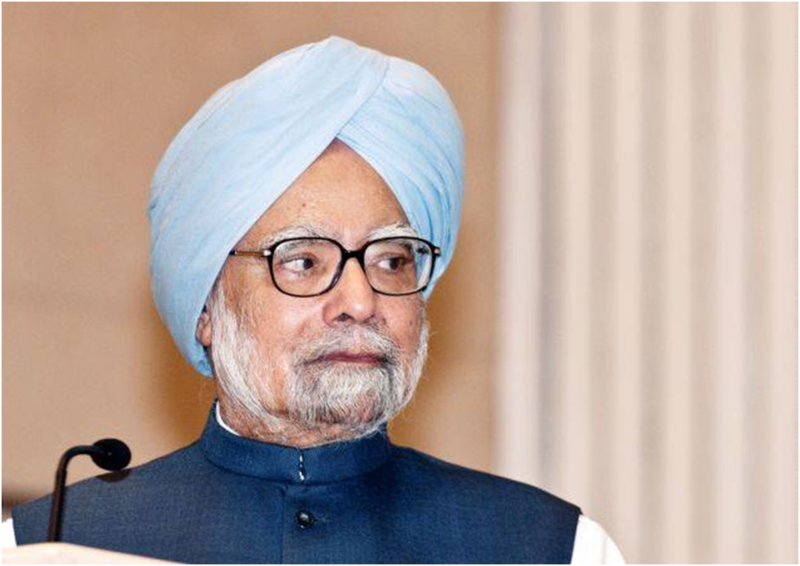 The UPA government led by Manmohan Singh has used the CBI to put pressure on UP Chief Minister Mayawati and former Chief Minister Mulayam Singh Yadav, whenever it has been threatened with defeat in the Lok Sabha. The Congress has a strength of 207 in the 545-member Lok Sabha. The pressure works because both Mayawati and Mulayam Singh are facing CBI cases for their disproportionate assets. The Congress alone cannot be blamed though. All governments, including the one led by BJP leader Atal Bihari Vajpayee have used the CBI to serve their own interest. A senior opposition leader from Bihar admitted on the floor of the Lok Sabha that they too had misused the CBI when they were in power. Many former directors of CBI have recorded in books they have written after their retirement that they were pressurised by one government or the other to prosecute or not to prosecute in an assortment of cases involving politicians and political parties. I was a member of the Rajya Sabha when the Bill to spell out control over the CBI came up before the Parliamentary Standing Committee on Ministry of Home Affairs. The then Chief Justice of India J.S.Verma had proposed in a Hawala case to set up an independent Directorate of Prosecution (DOP) to have control over the CBI. But no political party — all of them were represented in the Committee — wanted the CBI to be autonomous. I was disappointed when Justice Verma’s proposal was summarily rejected. The administrative control of the government over the CBI was endorsed. So much so that the Committee restored the Single Directive which the Supreme Court had thrown out. The Single Directive meant that the government’s permission was required before initiating an inquiry or action against officers of the rank of Joint Secretaries and above. There is hardly a minister who does not use these officers to serve his own or his party’s interests. The details of the 2G Spectrum scam, now revealed by the CBI, show how ministers were in league with the private parties in the allotment of licences without following any of the established rules. The Lokpal is toothless without control over the CBI and will be quite helpless to probe into the misdeeds of ministers or senior officials. My main objection is against the provision for 50 per cent reservation. Quotas are alright in jobs or educational institutions. But when we are selecting people for Constitutional positions, we want the best talent available. I am told that in the Congress, some voices have been raised for having reservations in the High Courts and even the Supreme Court. What kind of India are we building when parochialism is on the agenda of political parties for the sake of placating voters of one community or the other? Unfortunately, the government has already conceded the enumeration of castes in the in the 2011 census. I wish the counting was designed to learn how many poor people are there in the country. By introducing reservation in the Lokpal, the government is sowing seeds of division and conflict in the fight against corruption. I hope that Anna Hazare would raise his voice against reservation in Lokpal. Anna’s firm ‘no’ to the Lokpal Bill indicates that the battle may go to the streets. This is undesirable and will destroy the country. Political parties should collectively think how to sort out the issue without agitations. The dictum that the loss of one is the gain of the other is shortsighted. Whatever the moves or counter-moves of political parties, people should be vigilant and not play into their hands.